Well I'm very soon off to Salt Lake City and was up late finishing packing and swap materials gathering and thought I'd dash off a quick post. We had a great Monday with two clean and simple cards. Kudos to Mary Fish, my inspiration for the celebrate card. I love how the black makes the patterned paper (Go Wild) just pop! Check out the new Weekly Deals on my Blog at www.artgallerycards.com and try not to weep as this is theeeee last Weekly Deals!! (There's a button at the top of the page.) 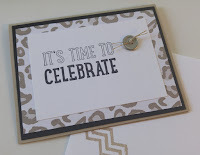 This just means that Stampin' Up has another surprise for us! Can't wait! I'll be away but I'll check email. Let me know if I can be of help to you! Happy stampin'! !